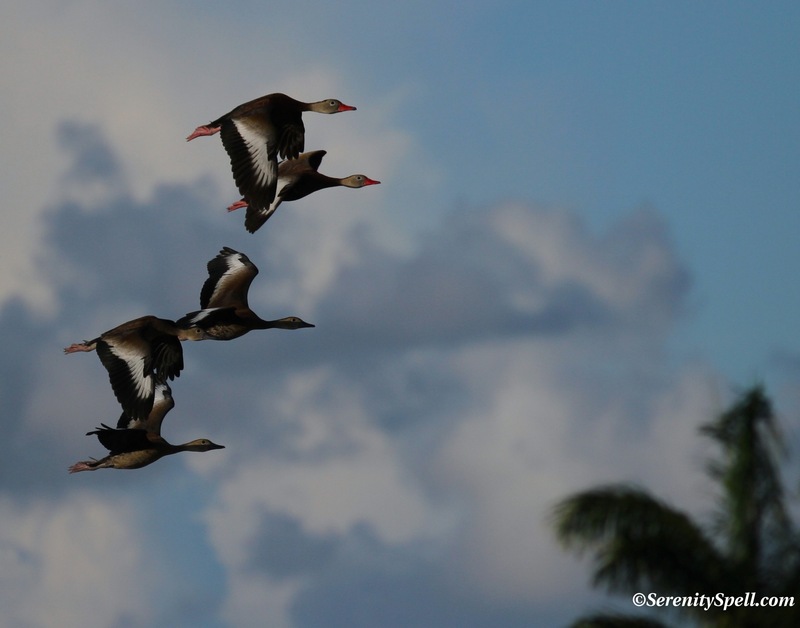 Black-bellied Whistling Ducks — also known as Black-bellied Tree Ducks — are a common sight in our wetlands. I adore these ducks: They have a quirky appearance, they’re docile and sweetly tempered, and are constantly paired. You rarely see one without its companion. 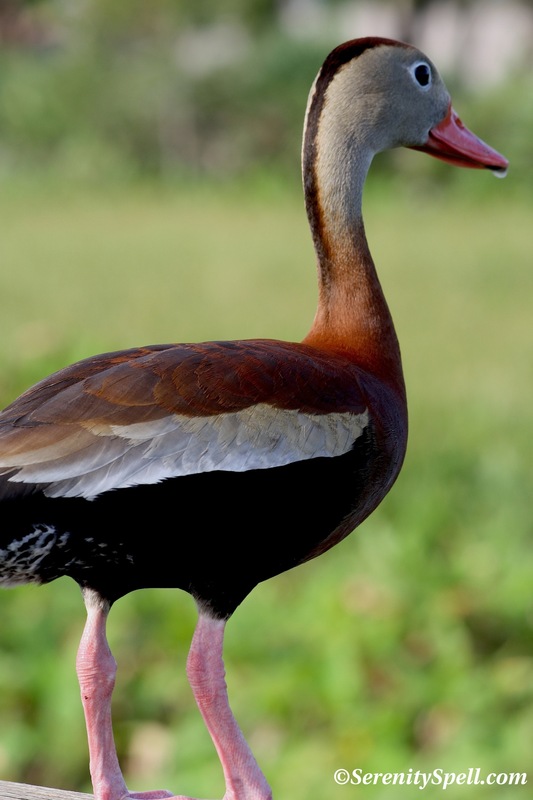 The Black-bellied Whistling Duck is one of only two whistling-duck species native to North America, and is most often referred to as simply the “whistling duck” in our area — and in the South in general. These ducks are considered unusual for North American waterfowl, with their striking appearance, long, dangling legs, and odd feeding habits. The males and females of the species look alike. 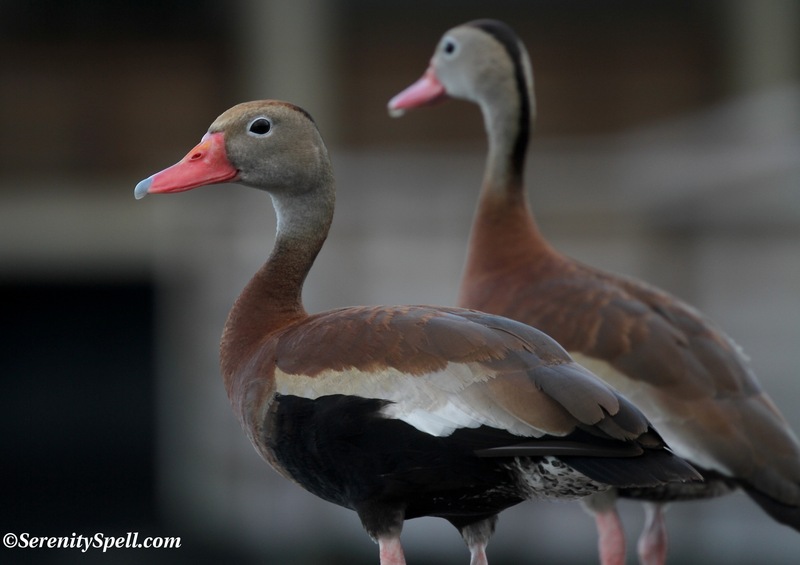 Mainly non-migratory, Black-bellied Whistling Ducks are native to the southernmost United States and South America. They live in freshwater ponds, lakes, and marshes, or cultivated land and reservoirs that are plentiful with vegetation. They usually nest in hollow trees, but will nest on the ground when necessary. As cavity nesters, they make use of chimneys, abandoned buildings, or nest boxes. Nest boxes have been increasingly provided to these ducks over recent decades, thus helping rebuild their numbers. It’s common to see these whistling ducks feeding on vegetation as they wade through the shallow waters, but they’ll also consume arthropods and aquatic invertebrates. In other areas, they feed on recently-harvested fields for leftover seed and invertebrates turned up by farming equipment. In years past, overhunting of this docile species was a great concern — however, over the past 30 years their populations have increased significantly (nest boxes having helped their cause). They’re sweet and colorful additions to our wetland ecosystem. The Black-bellied Whistling Duck is unique among ducks — they’re more like geese and swans, in that they form strong monogamous bonds. Pairs will often remain together for many years. And they’re progressive! Both the male and female share the tasks of raising the young, from incubation to rearing. They truly are beautiful and I’m so glad to hear people are helping now, with nesting boxes etc. Their bodies have a lovely mixture of dark colors. I adore their coloring… And in flight, they’re especially striking! Such sweethearts. One of my favorite birds. I love to hear them whistle when they fly overhead. It’s funny, but I’ve yet to hear the tell-tale whistling… Or if I have heard it, I’ve put it to another critter! Love these ducks! Incredible picture of them in flight! Thanks so much! I’m lucky to get so close to these guys — they’re so sweet and docile! Thanks so much for sharing our sweet and colorful ducks! Whistling Ducks are new to me, FeyGirl. Pat Bean mentions they whistle as they fly overhead, which I assume is how they get their name. Is the whistle a vocal sound or the sound of their wings? Cool! I’ve never heard of this one. What funny naked old man legs they have! Seriously, though a beautiful bird, great photos (as usual!) and fun information. He is so beautiful ! Wish I could see one in the wild, but these photos are amazing and are the next best thing to live. They’re so very sweet — between their unique coloring and docile temperament, they’re hard not to love!! What a beautiful bird… I wish we had them up here. Loved your photos. Thank you! These guys are truly unique — and so very docile. They’re hard not to love! Lovely photos. I’ve never seen these before. Thanks so much! I adore these guys… So very unusual, colorful, and sweet! Nice shots… very pretty ducks. Thanks so much! The really are striking… And so very sweet. Wonderful ducks and photos. They seem so sweet, almost naive (in a nice way, kind). Thanks so much! You nailed it RIGHT on the head; so observant! They’re so docile and sweet, that’s exactly how they seem… I’m just thrilled that they’re now more protected from over-hunting. They are very pretty. I would love to hear the sound they make. We have a duck here whose wings make a whistling sound when they fly and they are frequent visitors to a long slow riffle on the river near our house. Ahhh…. So it IS their wings that produce that whistling sound, yes? Someone else had that question, and I couldn’t answer it (where the whistling sound comes from)! These guys are so sweet — exceptionally docile. They’re hard not to love. I was born and bred in Florida, so your blog is especially special. Although I do not remember these lovely ducks, I do recall the sparkling white egrets in the ‘Glades. I am following you now.and admiring your dedication to wildlife. How wonderful!! I’m so happy that I can provide snippets of your past experiences in the state. I’m surrounded by much beauty, being near the Everglades. Thanks so much for your kind words — I hope that showing a bit of the land’s and the creatures’ beauty to the world helps, even just a tiny bit, in the greater understanding of this most amazing and threatened place. I have had the honor of observing a pair of these wonderful ducks with their precious seven babies in tow right in my backyard for the last two days. I was so excited to find this article and learn a little about them. Thank you.